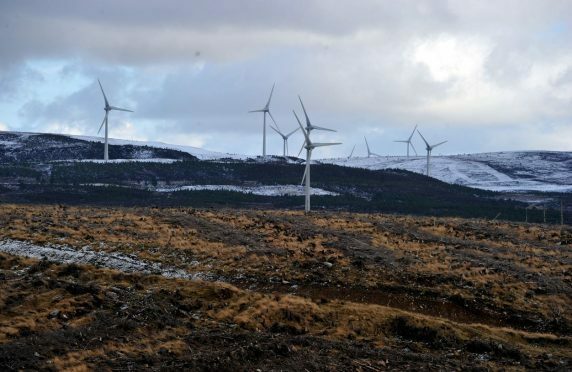 Force 9 Energy, who are the firm behind the Clash Gour development, initially proposed 63 turbines for the project south of Forres. However, after detailed studies to determine the capacity of the site about seven miles from the town, that total has been reduced to 47. The turbines will almost encircle the existing Berry Burn and will be up to 575ft tall – which is 250ft higher than those already there. A series of exhibitions will take place next week. They will feature a 3d display to show what the renewable energy project will look like in the landscape. Andrew Smith, Force 9’s head of planning and development, said: “We received very useful feedback from the first round of exhibitions held in March last year and have subsequently held detailed discussions with community representatives and other consultees regarding the design and layout. The first exhibitions will be held on Tuesday from noon to 3pm at Elgin Town Hall and from 5-8pm at Edinkillie Community Hall. On Wednesday, they move to Archiestown Village Hall between noon and 3pm and the Houldsworth Institute in Dallas from 5pm to 8pm. There will be two final opportunities to view the plans on Thursday, at The Grant Arms Hotel in Grantown from 11am to 2pm and from 4-7.30pm at Forres Town Hall.